As all our patients will be aware, Bicester is growing rapidly. It is projected that the population of Bicester and surroundings will increase by 20,000 to 30,000 over the next decade or more. All the practices in Bicester have seen their patient lists grow and have been actively planning, together with the Oxfordshire Clinical Commissioning Group (OCCG), how best to provide for this on going population increase. Currently in Bicester there are three GP practices: Bicester Health Centre on Coker Close, Montgomery House Surgery which is situated opposite in Piggy Lane and the Alchester Medical Group which provides services from Victoria House, Buckingham Road and Langford Surgery, Nightingale Place sites, as well as a branch surgery in Ambrosden. All these practices could therefore see lists increase individually by between 5000 and 10,000 patients. This represents a huge step up in the staff numbers and clinical space required. Alchester Medical Group and Montgomery House Surgeries do not have the room to expand their buildings and clinical space significantly on their existing sites and are looking for a new, combined, site. It is anticipated that both practices will remain separate but share a building and car parking. The new site has not yet been agreed but is likely to be in one of the areas of new housing development on the outskirts of Bicester. It is unlikely that this move will occur before 2-3 years time, to allow for a site to be secured, planning and building to occur. Option 1: Building a new multi-storied Health centre on our existing site to accommodate both Bicester Health Centre and Montgomery House surgery. For various reasons including logistics and cost this was not felt to be a viable option. Option 2: Moving with one or both of the other practices to a new site. There were several potential advantages to this option including moving to new purpose built premises, the benefits of multiple practices and potentially other community services being co-located on a single site and significantly more parking. However finding a site large enough to accommodate all three surgeries would have been difficult and most significantly it was felt that the loss of our current central location, adjacent to the community hospital and geographically convenient to many of our patients, was something we hoped to avoid losing. Option 3: Expanding on site. We are fortunate to have significant capacity for expansion within existing area of our premises and potentially also into the adjacent Julier Centre building next door in years to come. We believe it is viable to expand to accommodate our growing population over time and that this would have the benefit of retaining our current location, which we believe is both important to our patients and provides convenient access to the community hospital facilities. 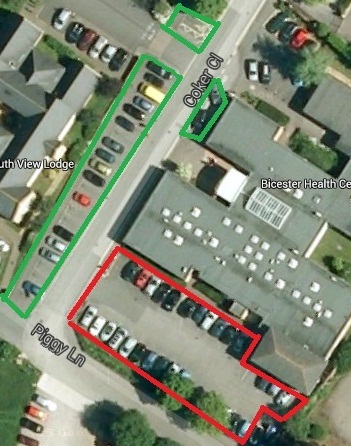 Bicester Health Centre has therefore opted to stay on site and expand our clinical space over time. The main disadvantage to this option will be the limitations on parking. This is a problem that is faced by many older medical developments in city and town centres: that whilst location may be in many ways ideal, parking will always be a potential challenge. Whilst we can of course maintain the parking spaces currently available, there are no current options to increase these. We have made the town counsellors aware of this issue and hope that other opportunities may arise in time that may allow patients or staff access to alternative parking nearby. In the meantime we ask our patients to consider all the options available to them to access our site, including being dropped off, public transport, bicycle or walking if they are able. We currently also offer surgeries early on Tuesday morning and late on Monday and Wednesday evenings to help improve access at less busy times. We encourage telephone consultations and are soon hoping to be taking part in a trial of software that will allow patients to access GP services directly via our website. We have also been working with our Patient Participation Group on this problem and they have helped produce a leaflet outlining the transport options to the surgery. We welcome comments and input from our patients on our future plans, including any ideas and suggestions you may have to help with patient access and parking. Comments are welcome or through out Patient Participation Group (Read more information about the PPG). Online access will be resuming over the next few weeks. If you previously had online access, between now and the end of November 2018 please look out for an email with details of how to create your new online access log in. This address is generated by the new software which runs our text and email reminder service, but we can confirm the email has come from Bicester Health Centre. With the introduction of our new GP Records clinical system, we are now able to offer patients a new app for smartphones. This will provide messages from the practice about appointments and health information related to you. It also has lots of information from NHS health which we're sure you will find very useful. We are currently sending out text messages to patients with information on how to obtain the app. We look forward to messaging you soon on your shiny new Bicester Health Centre app. We have now resumed sending out reminders about appointments by SMS text message. The new system allows you to text us back when you receive a text from us. If you want to cancel the appointment you have just had the reminder for, just reply with the word CANCEL . If you no longer wish to receive SMS text messages from the practice, please reply using the word STOP . This will stop ALL text messages, including future appointment reminders. In August 2018 the practice offered a total of 4484 appointments. 95.0% of patients (4258 patients) attended their appointment. Thank you! Remember - If you no longer need your appointment, please cancel it so somebody else can use it. Healthy Activities for the New Year! Are you looking for a guide to physical activities you can do at home, in the area, on your own or with others? Our Patient Participation Group have complied an excellent leaflet detailing activities you can do in the Bicester area. Why not pick up a copy from the surgery or download a copy now! Recently Which Magazine published a very useful guide to making the most of your GP consultation. The Patient Participation Group and GPs have used this as the basis for some tips on how to prepare for your consultation. Start booking appointments online TODAY!! CQC Report on the practice published. The CQC inspected the Health Centre on 10 August 2016. Their report was published on 4 October 2016, rating the Health Centre "Good" overall, and "Outstanding" for care of patients with long-term conditions and for being well led. You can read the full report here. New health and care smartphone app launched. Oxfordshire CCG has launched a new smartphone app to provide local people with valuable advice about the best places to get help when they are ill or injured in Oxfordshire. The ‘Health and Care Oxfordshire’ app uses global positioning technology to allow people to find the most appropriate health service like GP practices and minor injuries units wherever they are in Oxfordshire – for more information see here. Friends and Family Test...How are we doing? Since 1 December 2014, all GP surgeries in England have introduced the Friends and Family Test questionnaire. This is a very quick and simple way for you to give feedback about NHS services you have experienced. You will find questionnaires available around the surgery to complete, or if you prefer you can complete a Friends and Family test questionnaire on line. Please take a few seconds to let us know how we did after your consultation. Thank you. We know that parking has been particularly difficult for some months now and in response to feedback from patients we have now introduced a controlled parking scheme. Patients are free to use the parking bays all the time they are in the surgery or using the on-site dispensary. Anybody using the parking area that is not using the surgery could be issued with a parking penalty notice. We hope that this will ensure parking is for patients only and improves the availability of spaces. IMPORTANT NOTE: Please only use the spaces directly opposite the Health Centre. If you use parking spaces at the other surgery nearby, at the Community Hospital or on the road you may return to your vehicle to find a parking charge has been issued. In the picture below, the patient parking areas are outlined in green.